As a quick reminder, a medical directive is loosely defined as an instructional document which provides instruction for your individual medical or health care needs and appoints a person you trust, called an agent, to also make health care decisions for you. The reason we say it is “loosely defined” is that it is possible to just have your medical directive give instructions for your individual medical or health care needs but not appoint a person to also make health care decisions for you. A durable power of attorney is similar to a medical directive but instead of it providing instructions for your individual medical or health care needs, a durable power of attorney provides instructions for the financial aspects of your life and appoints a person you trust, also called an agent, to make such financial decisions for you should you not be able to. So, once you have created these two documents, when should you review them and perhaps update them? Well, the answer to this question is personal in nature and different for every person. As a general rule though, it is a good idea to review your medical directive and durable power of attorney the sooner of every three (3) to five (5) years or every time you experience a life changing event. So what is a life changing event? A life changing event can be any event in your life which causes a material or large change. Common examples would be birth of a child, death of a child, marriage, divorce, drafting estate planning documents (such as a will or a trust), changing estate planning documents (such as a will or a trust), changes in your religious beliefs or personal wishes and preferences. 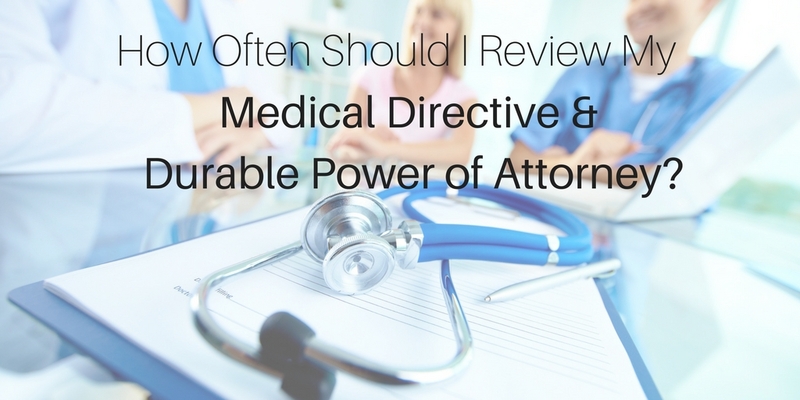 As we have discussed in previous articles, it is important that your medical directive and the durable power of attorney be in writing. We also recommend that they be drafted together in a coordinated effort to avoid contradictory provisions, and to provide and reinforce complementary powers between the two documents. So, if you review one document and make changes to it, make sure you review the other document to make sure that the changes you made to the first document are reflected in the other document. In any case, any person who would like more information about creating medical directives and durable powers of attorney or having their current medical directive and durable power of attorney reviewed should contact the Chilina Law Firm or another California attorney who practices in the area of estate planning for further information. Chilina Law Firm, a Professional Corporation, is a full-service estate planning, probate, trust administration, business law, and real property law firm that provides a wide-range of advising, transactional, and litigation services to its clients from its office located in Atascadero, California. The firm’s attorneys represent individuals and business entities in an assortment of transactional and litigation matters involving estate planning (including trusts, wills, powers of attorney, and medical directives), probate, trust administration, as well as general business law, contracts, corporate governance, land use, and real property. Chilina Law can be contacted by telephone at (805) 538-5038 or by email at info@chilinalaw.com or visit the Chilina Law Firm at www.chilinalaw.com. Chilina Law Firm is based in Atascadero, California and serves North San Luis Obispo County communities, including Santa Margarita, Atascadero, Templeton, Paso Robles, and San Miguel.